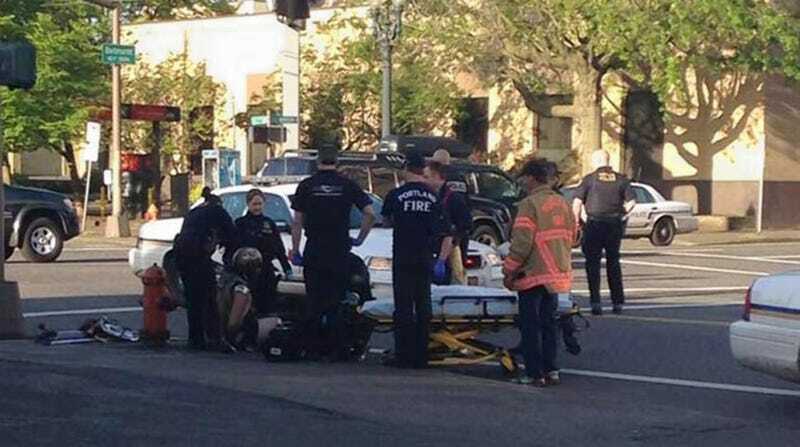 A Portland, Oregon man dressed in chain mail and calling himself a "high elf" claimed to be vanquishing the dark lord Morgoth when he stabbed a woman's car with a sword. It probably won't surprise you to learn that this J.R.R. Tolkien fan took LSD shortly before he decided to slay a sedan. What's great is that despite this high elf's state of mind, he managed to reference a pretty obscure figure in Tolkien lore — Morgoth is mostly described in the Silmarillion. Nobody was hurt in his sword fight, other than the car and the pride of high elves everywhere. In the picture above, you can see the high elf sitting on the ground in his helmet and armor. Apparently he was also carrying his trusty staff and shield. Eventually, police got him onto the stretcher and took him to a hospital for treatment.